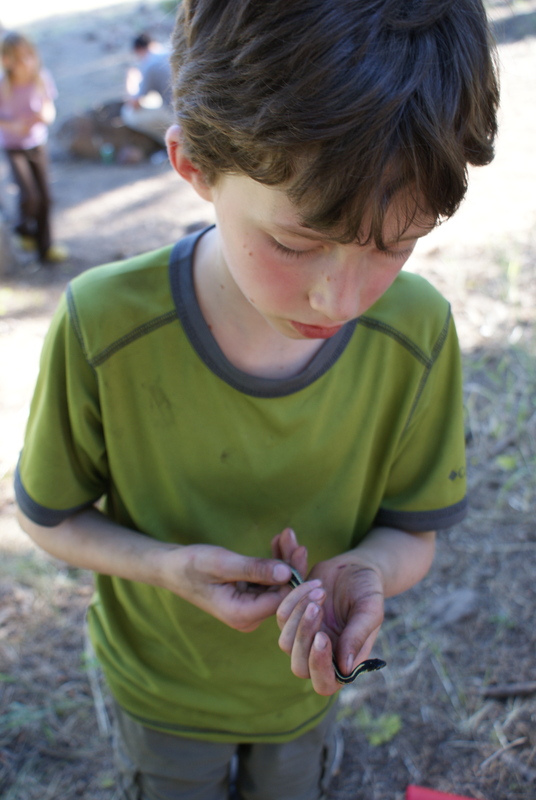 We had the opportunity last weekend to go camping with the Puget Sound Bird Observatory at their summer banding site. 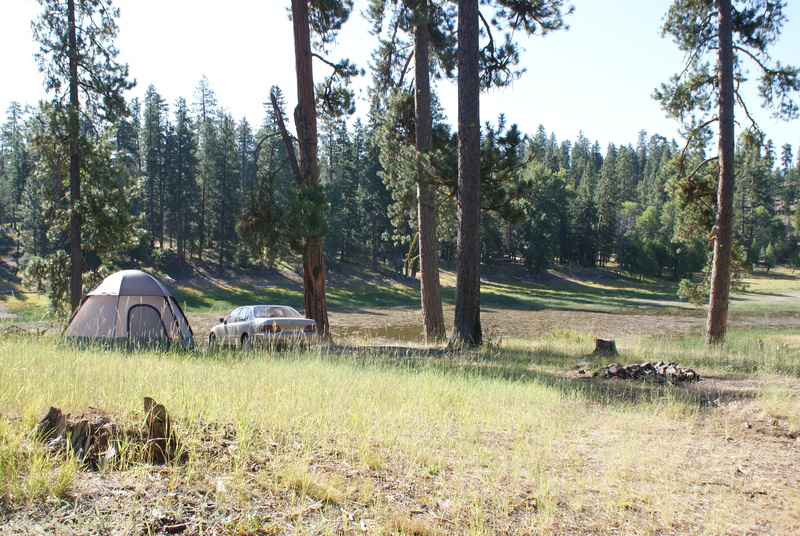 They have been set up for the month at McDaniel Lake near Naches, conducting research on birds and their habitats in the Pacific Northwest. We arrived on Friday evening to a dinner waiting for us. We ate quickly and set up our tent as dusk fell around us. 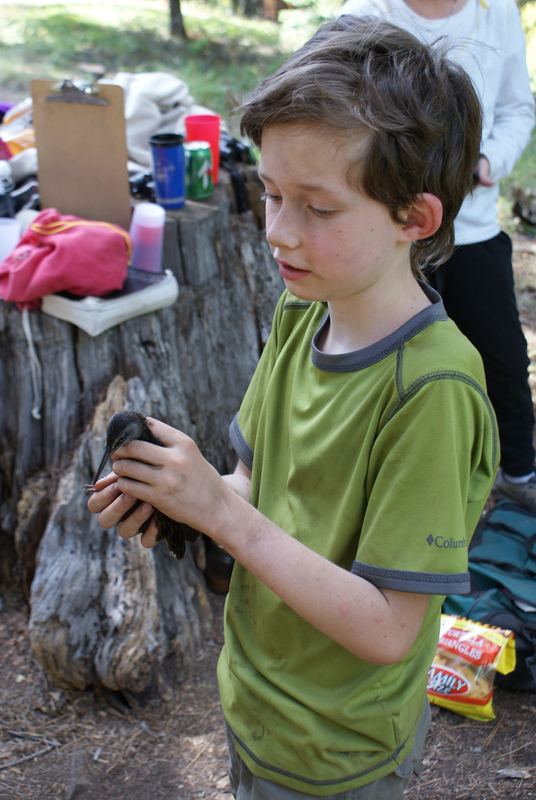 We sat around the campfire for a bit and began to get acquainted with our campmates for the weekend. 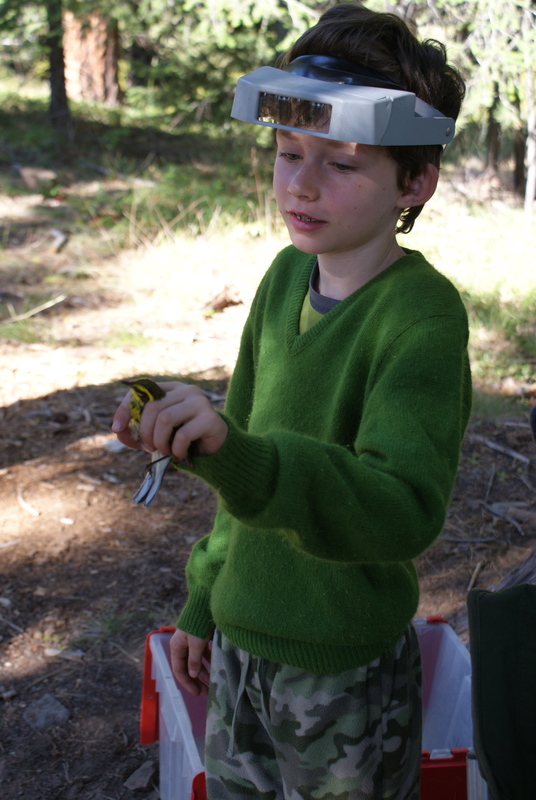 Then it was off to bed, because Saturday morning would begin early with the chance to watch bird banders in action. It was chilly during the night, and the stars were brilliant. We were woken up in the middle of the night by a large splashing noise in the lake. It sounded like something big was down there. Aaron couldn’t take the suspense, so he got out and tried to see, startling whatever it was (we later guessed it was an elk). A pair of owls also kept us awake with their soft hooting back and forth at each other, and I think I heard coyotes at one point. Crazy wildlife! 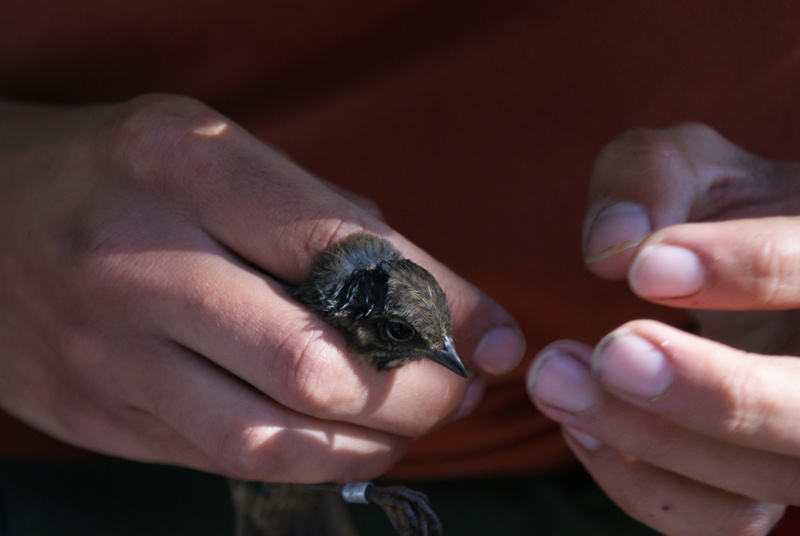 The banding crew puts up nets in areas where they think they might catch birds; in this environment, the nets are set up near water, since it’s a dry forest. More insects will be near the water, so the birds will have more food. 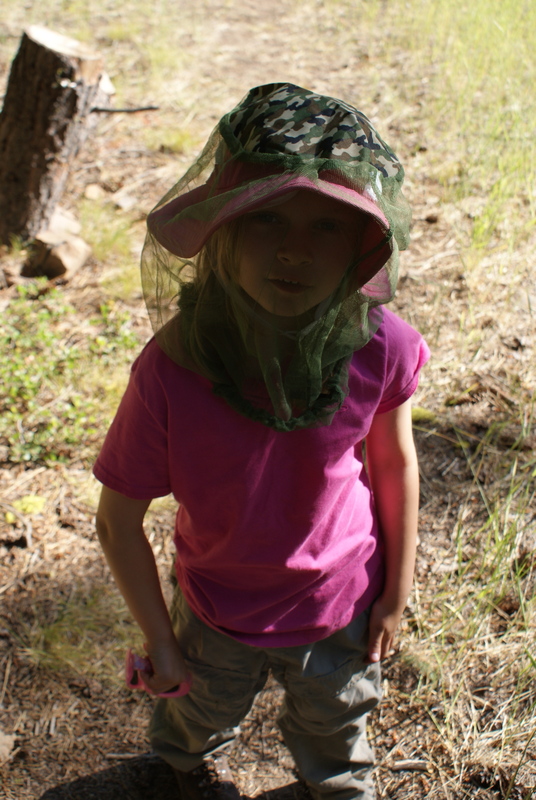 The nets are made of a fine mesh with pockets to hold the birds as they drop down. 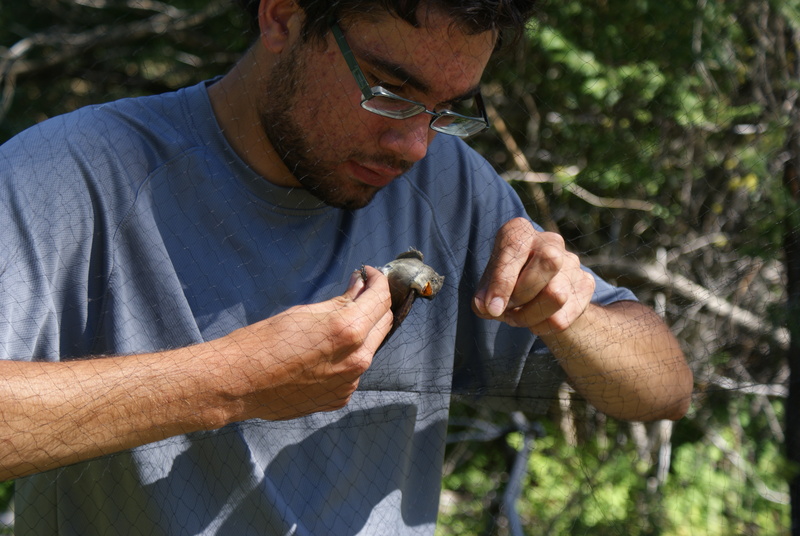 Banders need to carefully extract the birds from the net without causing harm; this can be tricky sometimes. 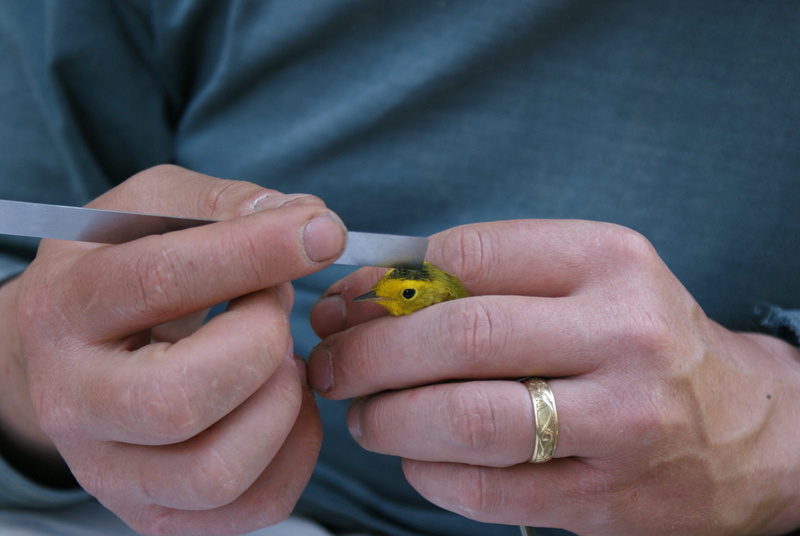 The researchers make a run to pick up birds about every hour in the morning, so the birds won’t be sitting in the sun in the net for too long. The nets are furled when the banders aren’t working, or if it’s too hot. 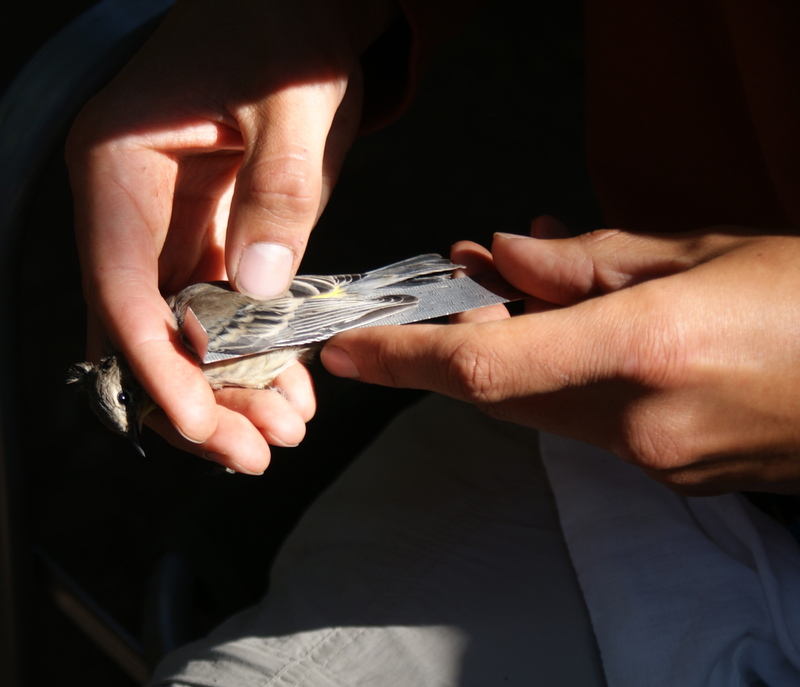 The birds are brought back to the banding site in cloth bags. 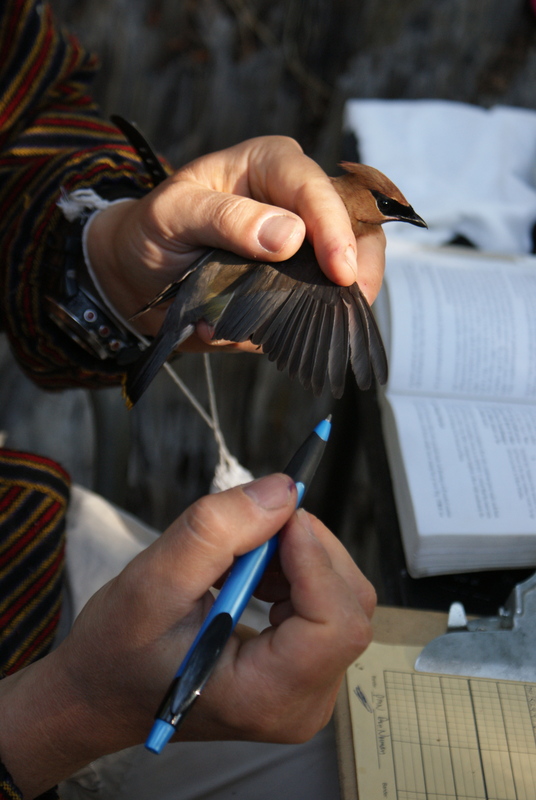 The researchers keep track of which nets the birds come from. 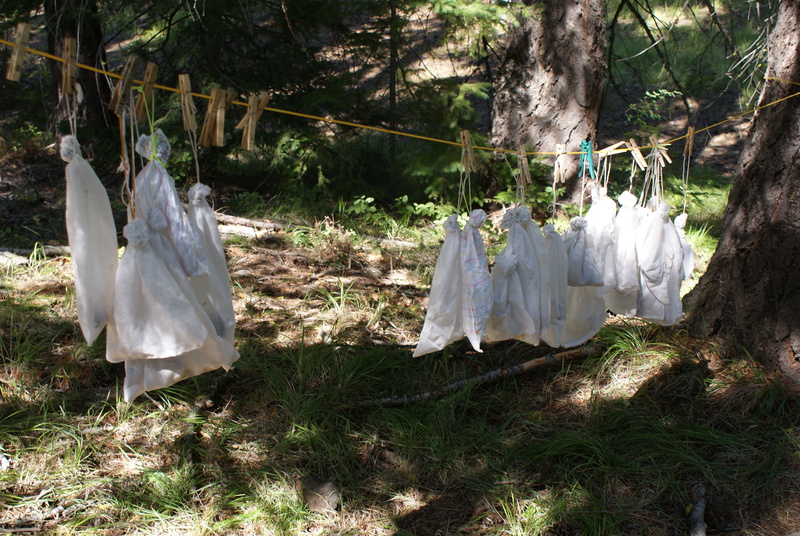 The bags are hung on a line in the shade to wait their turn for processing. The banders take out one bird at a time. 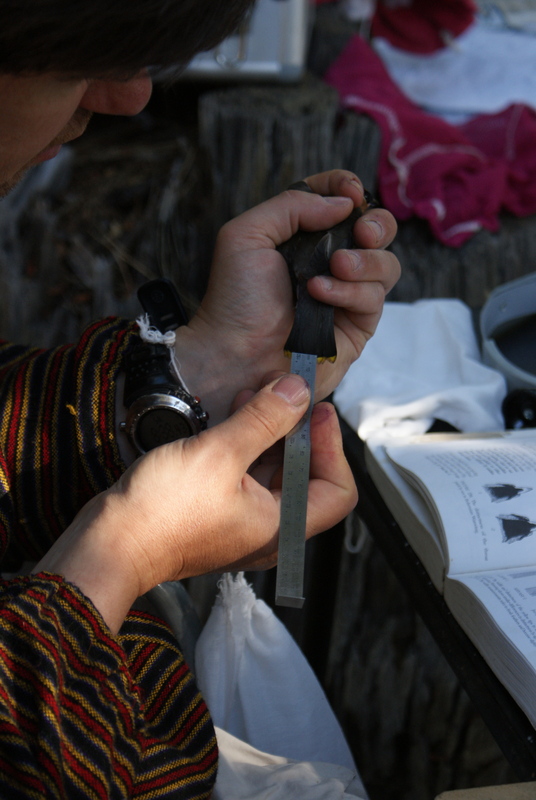 They identify the bird and take many different measurements. Some of the things they are interested in are: weight, fat content, feather wear and molting, wing length, and skull ossification (helps with figuring out the age). 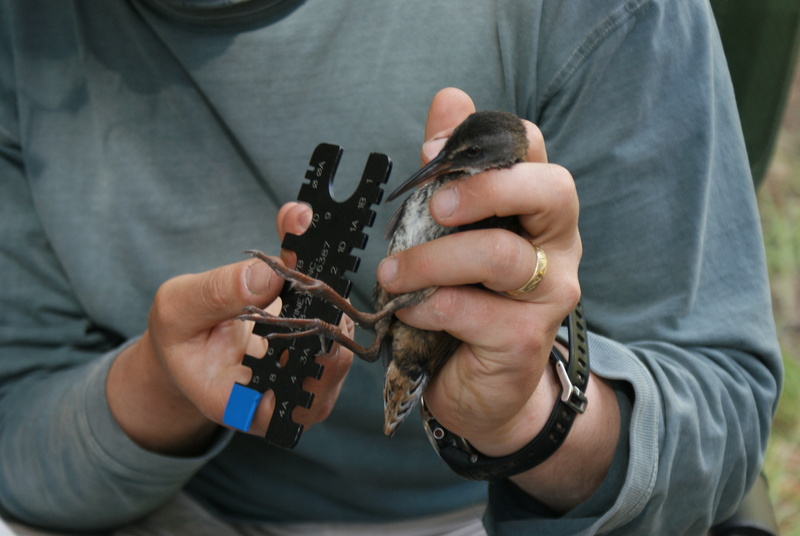 The bird is given a metal band on its leg to identify it in the future. If it already has one, it is recorded on a separate page. 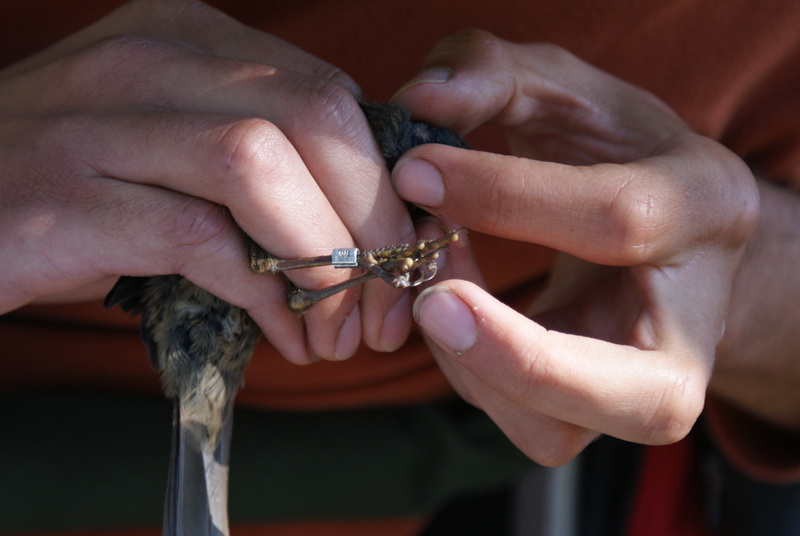 The researchers can then track if the same birds come back to the same places year after year. 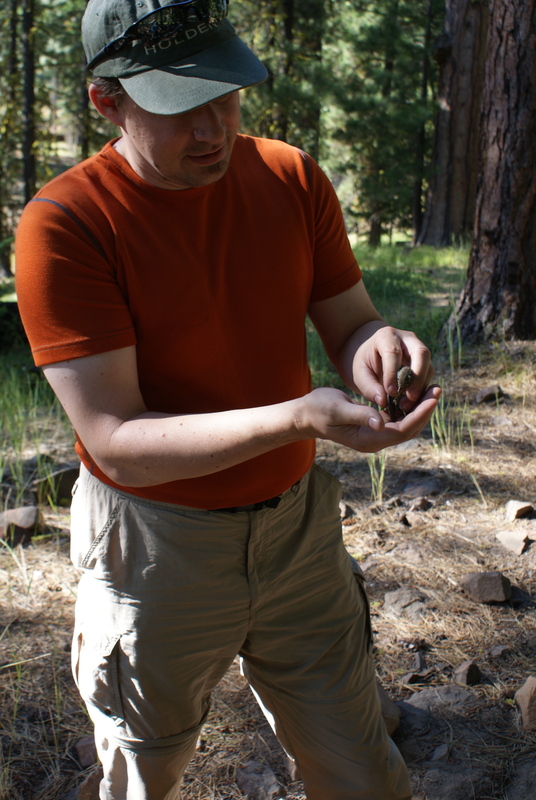 The bird is then released back to the wild. 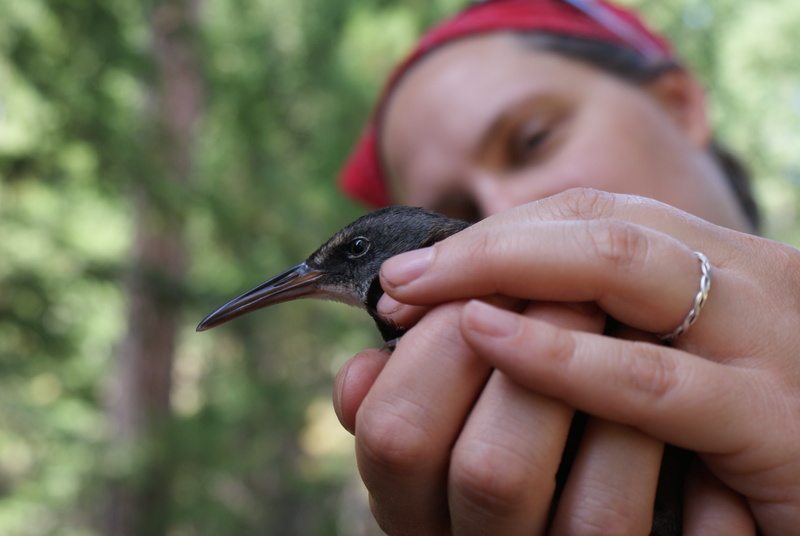 The researchers take care to cause as little stress as possible, dealing with more delicate birds first, holding them gently, and letting them go if they look too stressed. It was a remarkable experience to see so many different birds up close and in such detail. 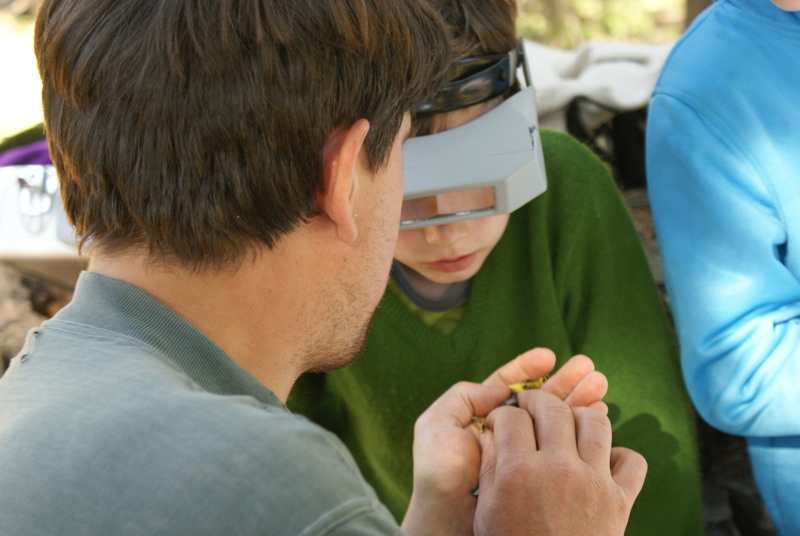 We could get a close look at beaks, feet, and feathers, and learned so many things about bird biology and identification. The kids (and adults!) 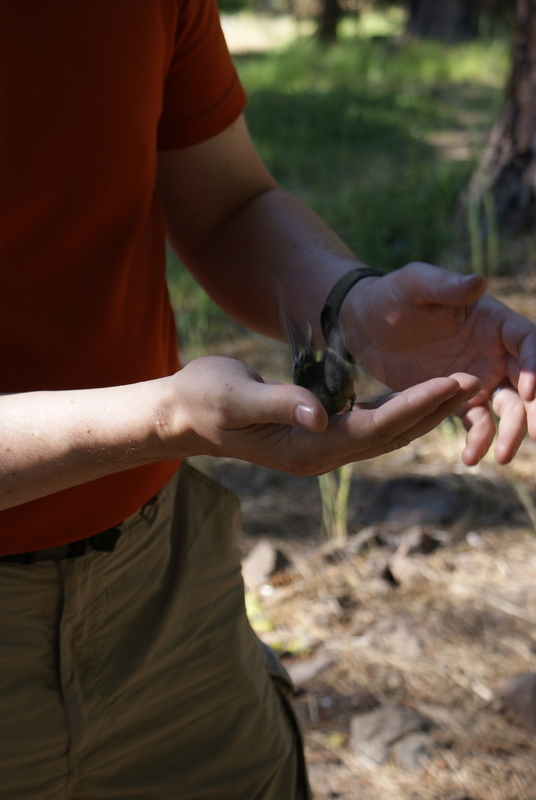 were thrilled to be able to touch the birds, and everyone who wanted to could let one go. 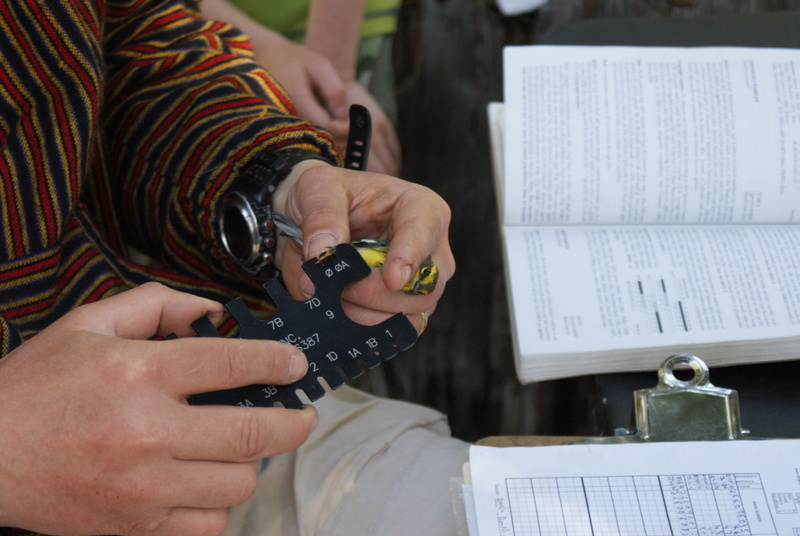 The older kids and adults learned the bander’s grip, and some folks got to help write down data and carry birds back from the nets. Gabriel spent a large part of Saturday and Sunday morning watching the banding and being close to the action. Annika was interested, too, but got tired more quickly and spent more time back at camp playing with the younger children. 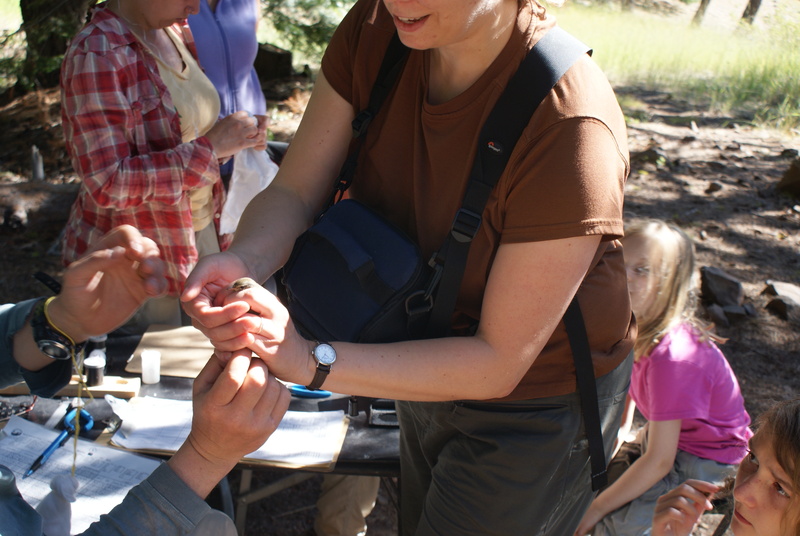 It was amazing to me how tiny and soft and light the birds were, as well as how deft the scientists were in handling them. 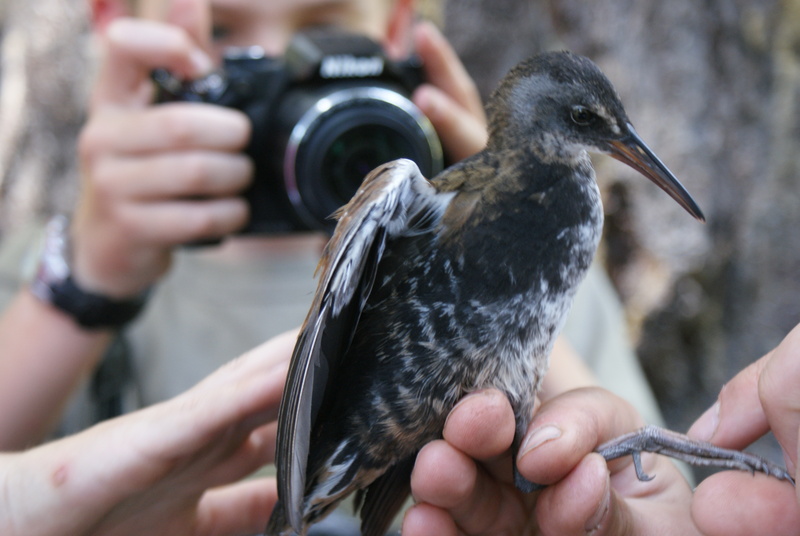 My favorite of the weekend was the Virginia rail that was captured on Sunday. I have never seen one before, and it was so fascinating to get an up-close and personal view of this secretive and shy bird. I also really liked the various warblers with their bright patches of yellow, and the large red crossbills, spunky and squawking. Saturday afternoon was spent relaxing and exploring. 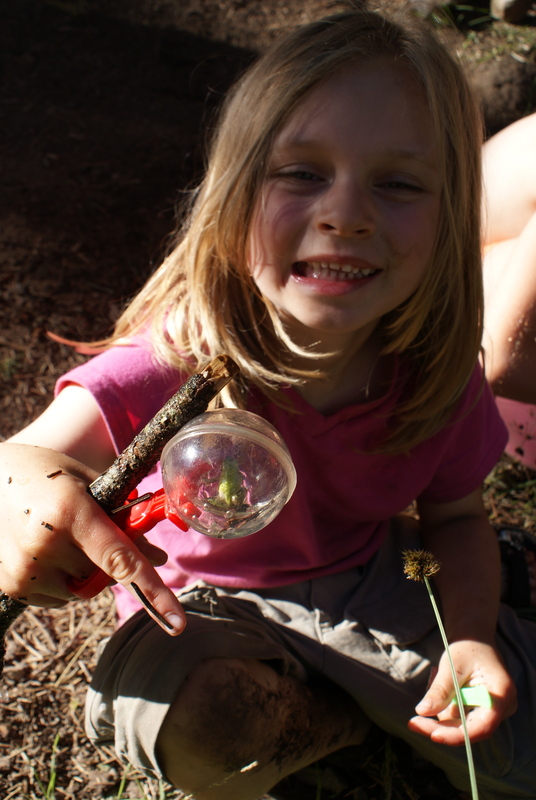 The kids caught frogs, snakes, grasshoppers, and various bugs. 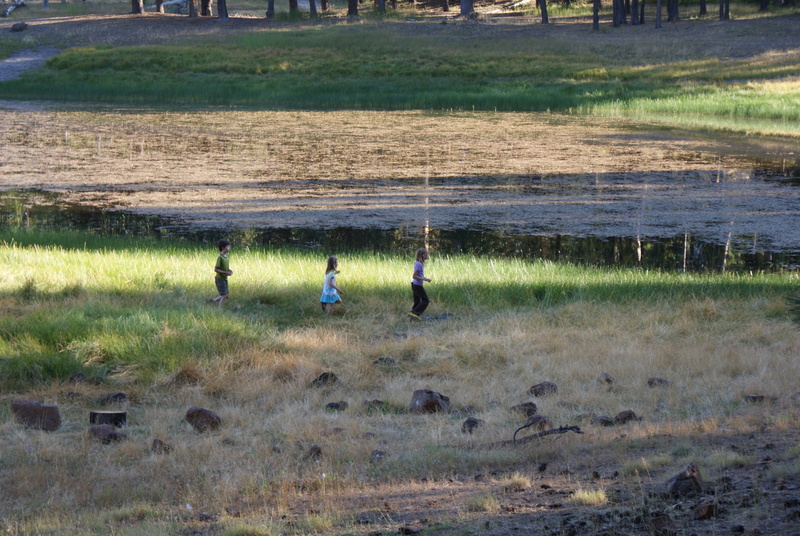 They played in the stream next to camp, and stalked the lake shore with their new best friends for creatures hiding in the sedges and grasses. Gabriel created a data form to record info about the snakes he found. The lake was not very appetizing for swimming. 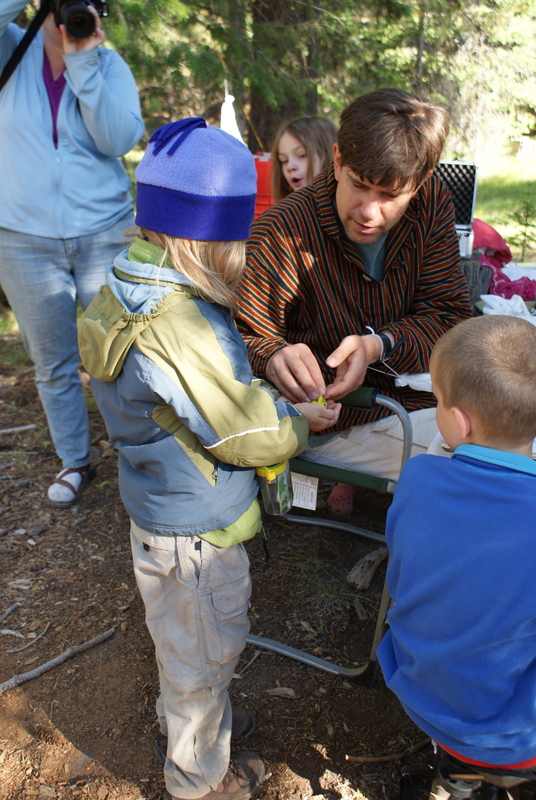 Many of the families went on a geocache scavenger hunt, and came back hot and cranky. But they all loved the prizes they got – geodes to crack open. In the evening a few of us went on a walk to see if we could get to a marshy area above the campsite, and to try to call pygmy owls. We were not successful at either, but did see some bats, and got to explore on the other side of the lake. 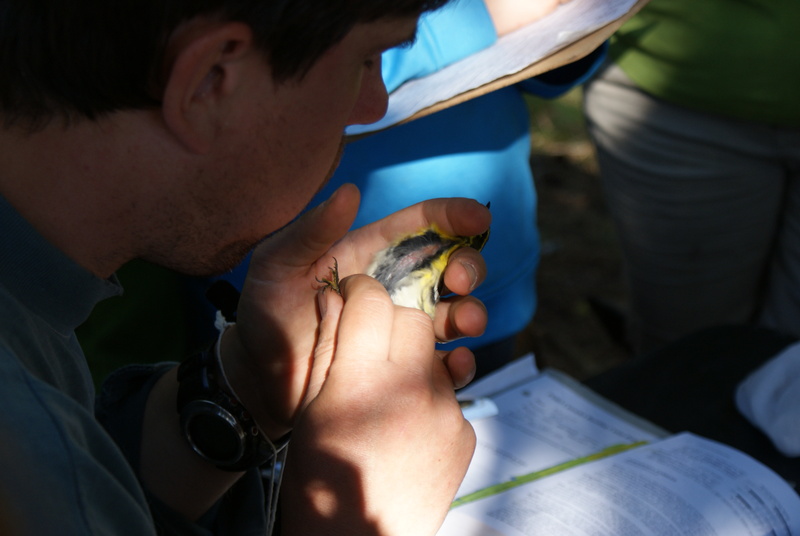 On Sunday we watched more banding, and packed up our things for the long drive home. We left in the early afternoon, feeling a bit sad to say goodbye to such an amazing place and the wonderful people we met. 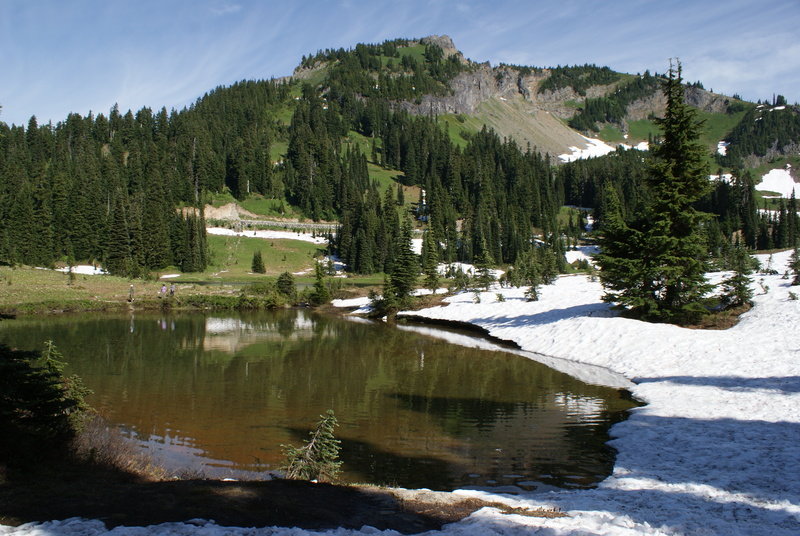 We took Hwy 410 back home, stopping at Tipsoo Lake for a break and some photo ops of Rainier. 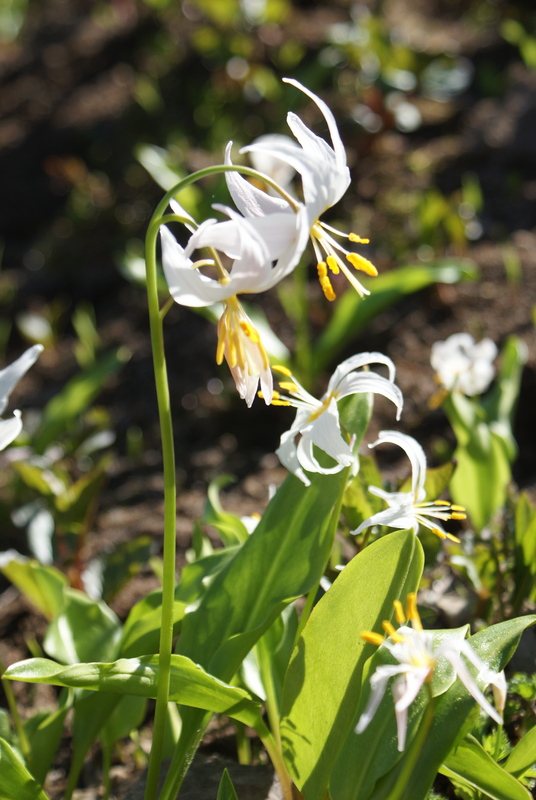 The flowers are still in full bloom, even as the snow is still melting. Everything is green and lush and bright. We looked a sight compared to all the shiny clean tourists – my children looked like street urchins who hadn’t bathed in weeks, and Aaron and I didn’t look much better. So we pushed on home to showers and clean clothes, and fell in bed exhausted yet filled to the brim. If we can, we’ll be back next year. We are so grateful to Emily, Dan, Joey, Erin Sara, and everyone else for making this a spectacular and memorable event for all of us. What a marvelous experience for you all. How did you find out about this? Two years ago PSBO had a table at the Edmonds Bird Fest. 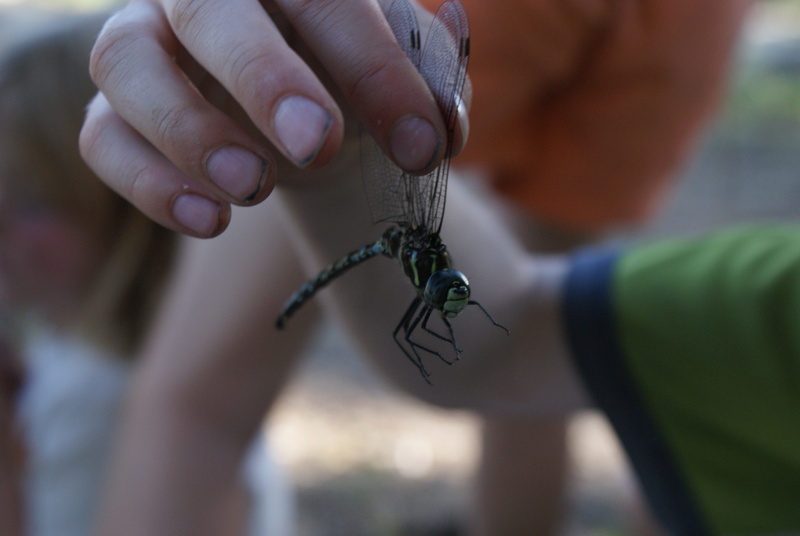 The kids and I were fascinated by what they did. Gabriel was ready to join up, but you have to be older and go through some serious training to participate in the banding. But we signed up for their email list, because they said they occasionally have events where people can observe the work. Luckily our schedules aligned this year and we were able to go!